Seating is limited. Please RSVP to vanisri.mills@dcnz.net by 29th May. Note on 21/05/2014: All seats have been booked now. Sorry for this. Please look for next seminar. It will be notified on this website. 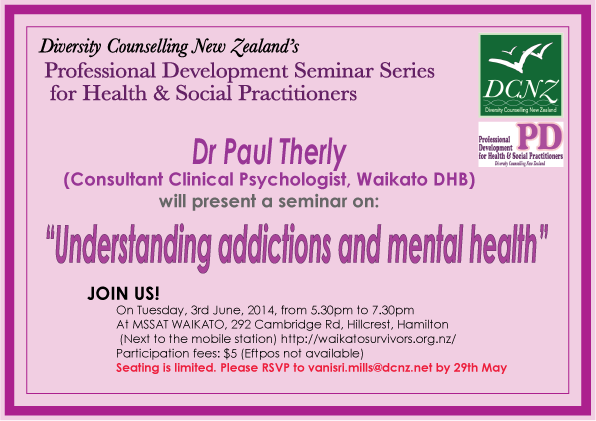 The following is a brief overview of the seminar on Mental Health and Addictions held 3 June 2014. Through the course of the evening Dr Paul Therly led the audience through understanding addictions and the links with mental health. He spoke of the current use of working with people through a Bio-psychosocial lens and the shift from confrontational practice to clarifying practice. There was an overall emphasis on the therapeutic relationship, utilising holistic and integrative treatments. Dr Therly talked on the client centered approach and the importance of developing a relationship with the person so they can speak with more openness for example "so they can say why they don't want to disclose" (Therly, 3 June, 2014). Throughout the presentation I also became aware of how Dr Therly's approach when working with people attended to shifting the power imbalances which occur in the therapeutic space. My overall thought of the evening was that working with people experiencing Mental Health and or Addictions, as counsellors/therapists, it is about supporting people as they traverse complex lands where fear is ever present. I found the evening informative, helpful and applicable to the work I do with youth and families.